With intense natural beauty, incredible wildlife and jaw-dropping scenery, South Africa is a dream destination for a wild-at-heart couple seeking a unique honeymoon. A road trip is the best way to explore everything the country has to offer: start in Cape Town and stay at chic bolthole Kensington Place on the slopes of Table Mountain – it’s just a short drive to the beach. From there, head down the stunning coast to Birkenhead House in Hermanus, a breezy boutique beach house with breathtaking ocean views, where you can while away your post-wedding stay watching whales from the private infinity pool on the cliff’s edge. Italy is the ultimate destination for gourmand lovers. I love its culinary culture and picturesque cities – it’s also incredibly romantic, with fantastic countryside vistas and beautiful Mediterranean views. Many hotels offer cooking classes with locally grown ingredients – one of my favourites is Castiglion del Bosco in Tuscany, which also serves up wine-tasting tours for two. Or perhaps Florence, the classic Italian lover’s city, is more your style? Stay at Gallery Hotel Art, just by the Ponte Vecchio: the hotel’s bar is famous for the tastiest cocktails in town. Miami is one of the wildest nightlife hotspots in the US, so if you’re a pair of party animals looking for sun, sea and dancing up a storm, this is the place for you. A luxurious retreat that’s just a stroll away from the nightlife, Metropolitan by Como is perched on the edge of its own private white-sand beach and has a rooftop hydrotherapy pool. Check out the hotel’s renowned spa for a day of post-party pampering, or take advantage of the sunshine on a private yacht trip. Rich in culture and history, Bali is an amazing combination of jungles dotted with intriguing temples, beautiful beaches and chic bars and restaurants. Honeymooners could start with a culture fix in Ubud to visit the rice padi fields and traditional local markets. I’d stay at Alilia Ubud, a hilltop boutique resort inspired by Balinese village life thats eco-conscious and has stunning views of the valley below. 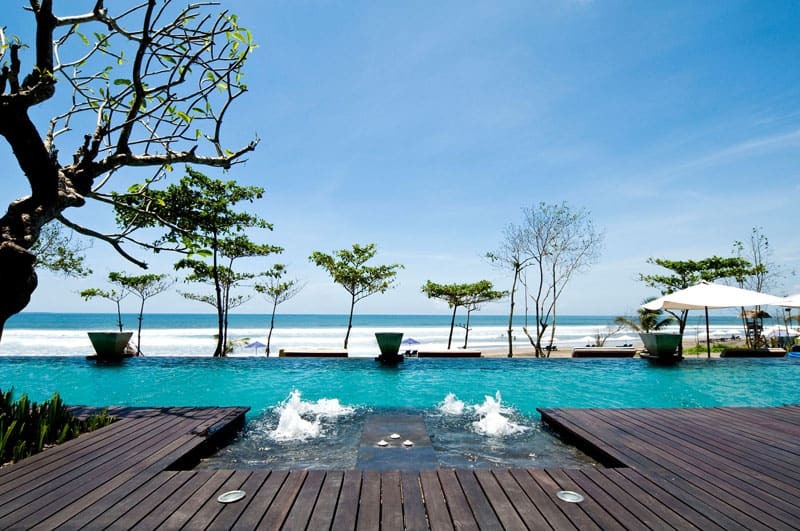 Combine that with a beach stay in Seminyak, full of cool bars, Instagrammable sunsets and private pools; luxurious Anantara Seminyak is right on the beach and has one of the island’s hottest rooftop bars. Berlin is possibly one of the coolest honeymoon destinations on the planet. It’s brimming with museums and historic sites, so it’s a unique spot for art and history lovers, and there are beautiful markets, fantastic food and buzzing nightlife on offer all over the city, too. I’d recommend honeymooners stay at Das Stue, a luxury boutique hotel with unique style – it’s fully equipped with a pool and spa, a Michelin-starred restaurant and flawless interior design. Runner up in the Best Newcomer category at the 2014 Smith Hotel Awards, it’s an ideal location for checking out all of Berlin’s best bits (including its own cosy bar, which on Friday nights hosts gigs). So come on, give me honeymoon envy and tell me where will you be heading for you post wedding jaunts? I couldn’t agree more Jean, I want to visit them all!! !